If you haven’t been living in a hole in a cave with both fingers plugged into your ears, you may have noticed that an awful lot of fuss gets made about Russian propaganda and disinformation these days. Mainstream media outlets are now speaking openly about the need for governments to fight an “information war” against Russia, with headlines containing that peculiar phrase now turning up on an almost daily basis. This notion that the US and its allies are fighting against Russian “hybrid warfare” (by which they typically mean hackers and disinformation campaigns) has taken such deep root among think tanks, DC elites and intelligence/defense circles that it often gets unquestioningly passed on as fact by mass media establishment stenographers who are immersed in and chummy with those groups. The notion that these things present a real threat to the public is taken for granted to such an extent that they seldom bother to even attempt to explain to their audiences why we’re meant to be so worried about this new threat and what makes it a threat in the first place. Which is, to put it mildly, really weird. Normally when the establishment cooks up a new Official Bad Guy they spell out exactly why we’re meant to be afraid of them. Marijuana will give us reefer madness and ruin our communities. Terrorists will come to where we live and kill us because they hate our freedom. Saddam Hussein has Weapons of Mass Destruction which can be used to perpetrate another 9/11. Kim Jong Un might nuke Hawaii any second now. With this new “Russian hybrid warfare” scare, we’re not getting any of that. This notion that Russians are scheming to give westerners the wrong kinds of political opinions is presented as though having those political opinions is an inherent, intrinsic threat all on its own. The closest they typically ever get to explaining to us what makes “Russian disinformation” so threatening is that it makes us “lose trust in our institutions,” as though distrusting the CIA or the US State Department is somehow harmful and not the most logical position anyone could possibly have toward historically untrustworthy institutions. Beyond that we’re never given a specific explanation as to why this “Russian disinformation” thing is so dangerous that we need our governments to rescue us from it. The reason we are not given a straight answer as to why we’re meant to want our institutions fighting an information war on our behalf (instead of allowing us to sort out fact from fiction on our own like adults) is because the answer is ugly. As we discussed last time, the only real power in this world is the ability to control the dominant narrative about what’s going on. The only reason government works the way it works, money operates the way it operates, and authority rests where it rests is because everyone has agreed to pretend that that’s how things are. In actuality, government, money and authority are all man-made conceptual constructs and the collective can choose to change them whenever it wants. The only reason this hasn’t happened in our deeply dysfunctional society yet is because the plutocrats who rule us have been successful in controlling the narrative. Whoever controls the narrative controls the world. This has always been the case. In many societies throughout history a guy who made alliances with the biggest, baddest group of armed thugs could take control of the narrative by killing people until the dominant narrative was switched to “That guy is our leader now; whatever he says goes.” In modern western society, the real leaders are less obvious, and the narrative is controlled by propaganda. And therein lies the answer to the question. You are not being protected from “disinformation” by a compassionate government who is deeply troubled to see you believing erroneous beliefs, you are being herded back toward the official narrative by a power establishment which understands that losing control of the narrative means losing power. It has nothing to do with Russia, and it has nothing to do with truth. It’s about power, and the unexpected trouble that existing power structures are having dealing with the public’s newfound ability to network and share information about what is going on in the world. 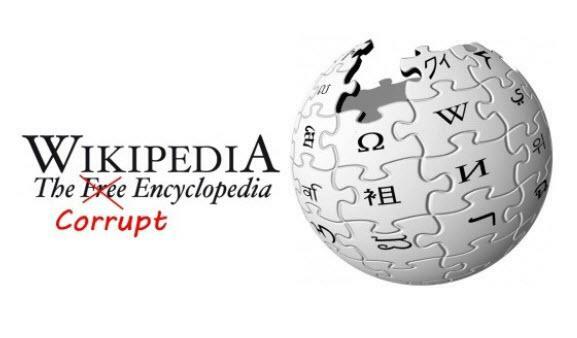 Until recently I haven’t been closely following the controversy between Wikipedia and popular anti-imperialist activists like John Pilger, George Galloway, Craig Murray, Neil Clark, Media Lens, Tim Hayward and Piers Robinson. Wikipedia has always been biased in favor of mainstream CNN/CIA narratives, but until recently I hadn’t seen much evidence that this was due to anything other than the fact that Wikipedia is a crowdsourced project and most people believe establishment-friendly narratives. That all changed when I read this article by Craig Murray, which is primarily what I’m interested in directing people’s attention to here. The article, and this one which prompted it by Five Filters, are definitely worth reading in their entirety, because their contents are jaw-dropping. In short there is an account which has been making edits to Wikipedia entries for many nears called Philip Cross. In the last five years this account’s operator has not taken a single day off–no weekends, holidays, nothing–and according to their time log they work extremely long hours adhering to a very strict, clockwork schedule of edits throughout the day as an ostensibly unpaid volunteer. This is bizarre enough, but the fact that this account is undeniably focusing with malicious intent on anti-imperialist activists who question establishment narratives and the fact that its behavior is being aggressively defended by Wikipedia founder Jimmy Wales means that there’s some serious fuckery afoot. “Philip Cross”, whoever or whatever that is, is absolutely head-over-heels for depraved Blairite war whore Oliver Kamm, whom Cross mentioned as a voice of authority no fewer than twelve times in an entry about the media analysis duo known collectively as Media Lens. Cross harbors a special hatred for British politician and broadcaster George Galloway, who opposed the Iraq invasion as aggressively as Oliver Kamm cheered for it, and on whose Wikipedia entry Cross has made an astonishing 1,800 edits. Despite the overwhelming evidence of constant malicious editing, as well as outright admissions of bias by the Twitter account linked to Philip Cross, Jimmy Wales has been extremely and conspicuously defensive of the account’s legitimacy while ignoring evidence provided to him. As outlined in the articles by Murray and Five Filters, the evidence is there in abundance. 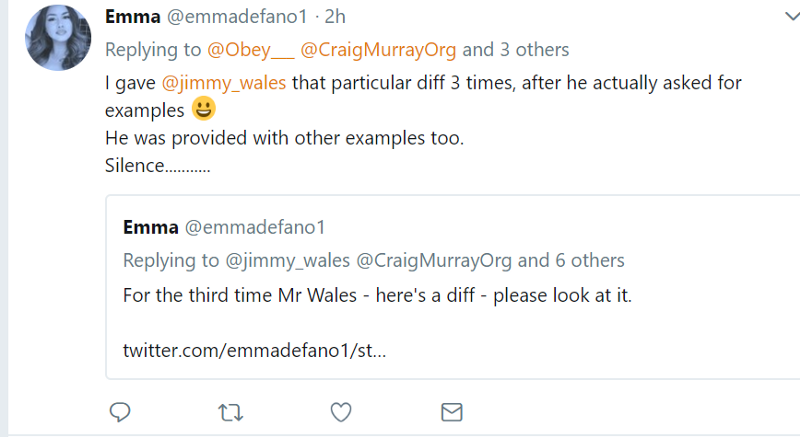 Five Filterslays out “diffs” (editing changes) in black and white showing clear bias by the Philip Cross account, a very slanted perspective is clearly and undeniably documented, and yet Wales denies and aggressively ridicules any suggestion that something shady could be afoot. This likely means that Wales is in on whatever game the Philip Cross account is playing. Which means the entire site is likely involved in some sort of psyop by a party which stands to benefit from keeping the dominant narrative slanted in a pro-establishment direction. A 2016 Pew Research Center report found that Wikipedia was getting some 18 billion page views per month. Billion with a ‘b’. Youtube recently announced that it’s going to be showing text from Wikipedia articles on videos about conspiracy theories to help “curb fake news”. Plainly the site is extremely important in the battle for control of the narrative about what’s going on in the world. Plainly its leadership fights on one side of that battle, which happens to be the side that favors western oligarchs and intelligence agencies. How many other “Philip Cross”-like accounts are there on Wikipedia? Has the site always functioned an establishment psyop designed to manipulate public perception of existing power structures, or did that start later? I don’t know. Right now all I know is that an agenda very beneficial to the intelligence agencies, war profiteers and plutocrats of the western empire is clearly and undeniably being advanced on the site, and its founder is telling us it’s nothing. He is lying. Watch him closely.